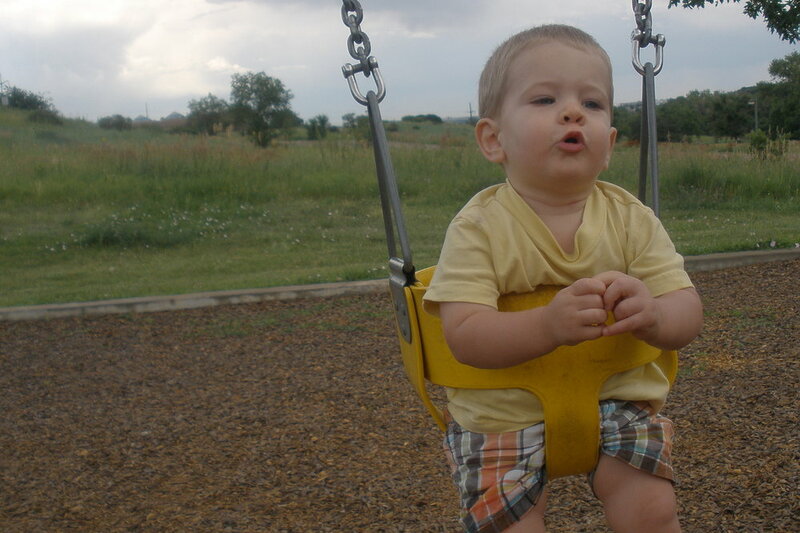 Bubby singing and swinging, the day before Grandma last saw him.In just a few hours it'll be exactly 21 days since I've seen, held, squeezed, smelled Bubby. It's killing me. I think I've been incredibly fortunate in my life up until this point because being the (semi) old fart I am, I've honestly never experienced a true physical longing for another human the way I am with Bubby. I was never separated from my girls long enough to miss their hugs so much my body ached. As babies and little kids, they were never away from me due to extended visits with relatives or hospital stays. As they got older and did stay at Granny's for a few weeks or go on trips with their youth group (luckily no hospital stays! ), I missed them, of course, but we were past the point of lots of hugging and snuggling so my body didn't ache for them while they were away. When they headed to college then moved out of the house, it was sad and I knew I'd miss them, but it seemed natural. In the same vein, Jim and I have spent very few nights apart in our nearly 30 years together, so I don't know what it's like to be the lonely wife longing to reunite with her hubby. But Bubby changed all that. When I first met him, just a few days after his birth, I got to spend hours and hours hugging and holding and rocking the precious burrito-wrapped bundle. We had only a few days together, but he'd become an integral part of who I am. He made me complete. He made me a grandma. Being a long-distance grandma, though, I had to get on the plane without him -- and I immediately felt an emptiness I'd never felt before. It lasted for days and I kept marveling to Jim that I don't understand how other grandmas all over the world seem to be okay with this feeling. They must be okay, I figured, because I knew a few long-distance grandmas and they didn't have agonized looks on their faces that mirrored the way I was feeling inside. Slowly I realized that long-distance grandmas have no choice, really, and that the searing pain eventually fades to just a low-level burn. Each time I'm blessed with a few days with Bubby, I go through a similar withdrawal when it's time to part. It's never as painful (and shocking) as the first time, but it's there, assuaged only by the fact that Megan and I have planned the next visit before the current one is over. We agreed at Bubby's birth that visits would be about every other month, with either them coming to us in the mountains or us going to them in the desert, so Grandma and Grandpa would get to know Bubby and he would get to know them. We've been surprisingly good about sticking to that schedule; a few times we've had mere weeks between visits. Not so this time. Bubby, Megan and Preston all got on the plane to head home this time with there being no plans, no purchased plane tickets, no formal agreement on when I'd next get to hug my Bubby. Finances are tight on both sides, and plane tickets seemed a luxury neither of us could afford. Until today, I've decided. Forget the tight finances. Some things are oh-so much more important than having a security blanket of funds in the bank. Getting to hug Bubby isn't a luxury or a frivolous want -- it's a need. And as soon as I close this post, I'm filling that need by heading to USAirways.com. So get ready for some loving, touching and squeezing, Bubby! Grandma and Grandpa are coming to visit!